I am a Realtor with JB Goodwin, and have a client interested in the home at 410 W. 4th Street, Cameron TX. I am having trouble finding any historic info on the home. He is looking to purchase, but would love some info on when/who/events, etc of the homes background. Any help you can give me?? Std email sent to Margaret. Email forwarded to MCHC members. It has been a pleasure talking with you during our past two telephone conversations. I believe that I'm now able to assist you, but only because of the mentorship of a fellow MCHC member, Mrs. Delores Mode and a newfound friend and Historian with the Cameron History Club, a Ms. Marion Travis. This has been one of my more interesting inquiries to research, since I had the information that you needed, but I was unable to make sense of it without the above ladies help. 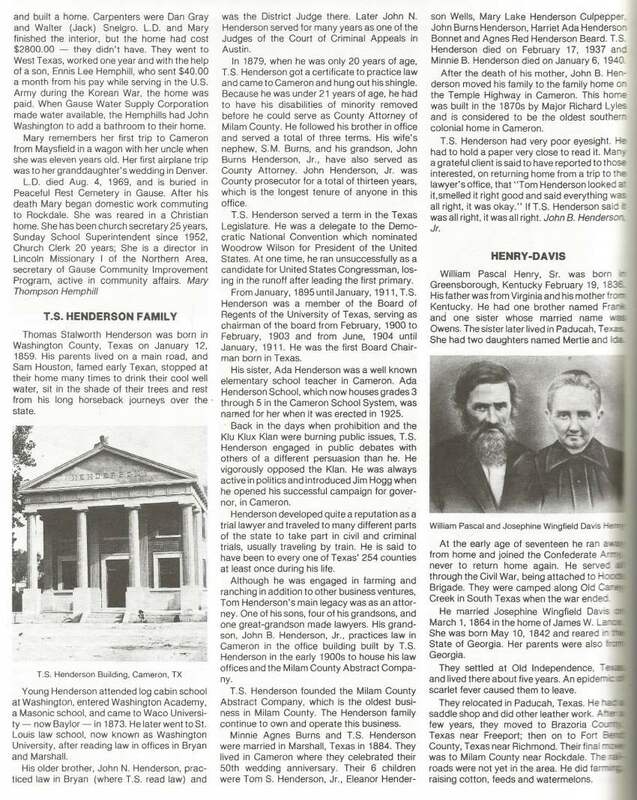 I believe that our first order of business is to read attachment number one which will help the reader understand the history and lineage of the Henderson family. 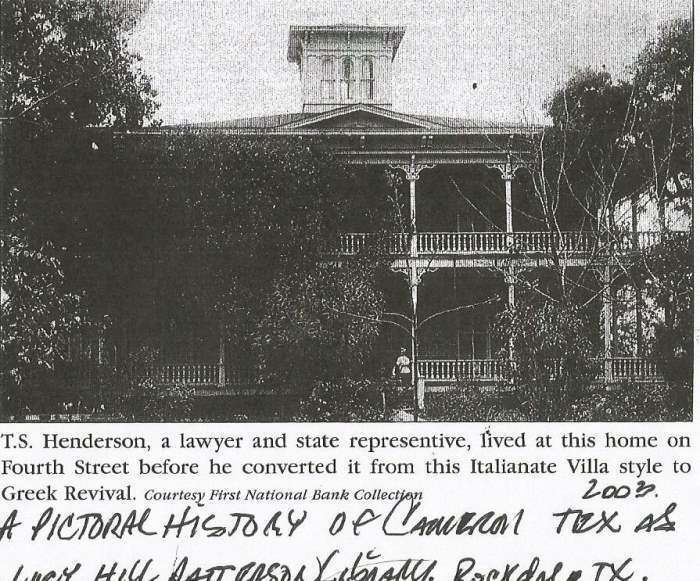 I might add that John B. Henderson Jr., and his family, also resided in the home at one time. Mr. John B. Henderson Jr. and wife now live off 7th St. in Cameron. Reference is: Matchless Milam, History of Milam County. 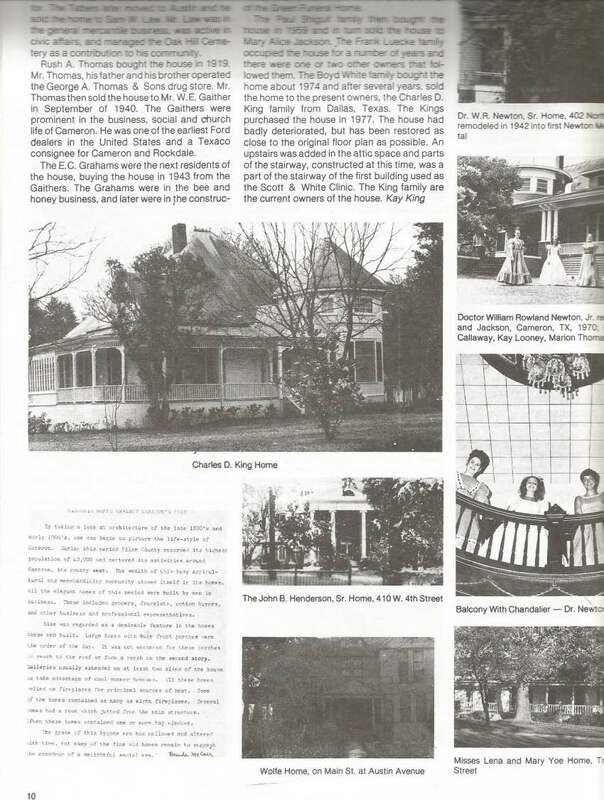 Compiled and edited by Milam County Heritage Preservation Society. Page 122. If you will now look at attachment number two, you'll see a small photograph, in the middle of the page, of what the home looks like today. There has been a considerable amount of restoration work performed recently, as you already know. Unfortunately, I am no expert on architecture, but in my eyes, I would call this Colonial. Same reference as above, page 10. Last but not least, please see attachment number three. I intentionally left it in Profile instead of landscape for enlargement purposes. You may care to print for convenience.The reference is as stated on the page. Here is where my confusion started and where the kind ladies listed above, clarified my thinking. If you'll note the bottom right photo, you'll see the T.S. 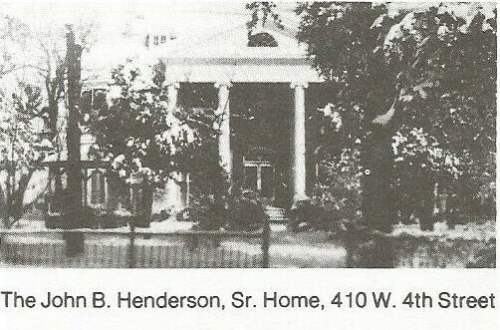 Henderson residence. You'll then read where it was converted from Italianate Villa style to Greek Revival. Again, as a layman of architecture, both Colonial and Greek have heroic columns. Please see; http://www.antiquehomesmagazine.com/Articles.php?id=35 .